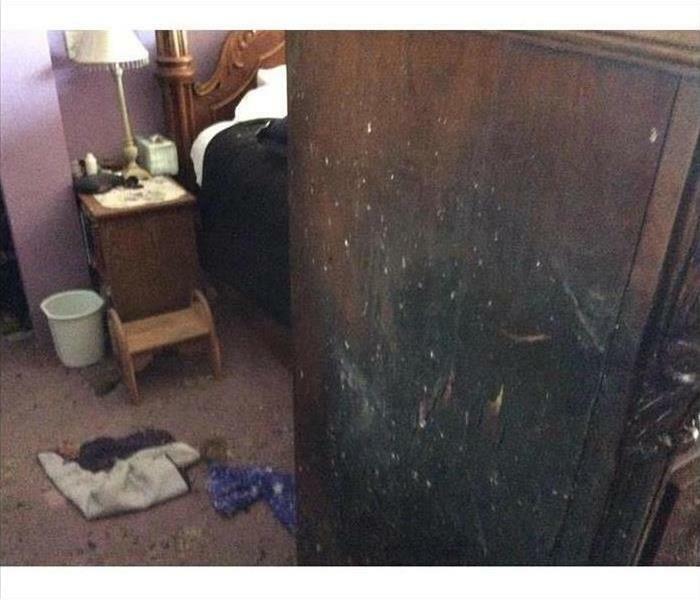 Even a small smoky mishap can leave some sooty residue on a child's bedroom in a Seal Beach home. Our SERVPRO technician is using a special chemically treated dry sponge tool to remove the light staining without smearing. When done right, in a case like this, no need to re-paint. The show can go on at the Puppet Time Theater. Fires can cause both fire and smoke damage to your home. Quick action is key to a full recovery where odor is removed as well. If your home has a similar fire damage scenario, contact our IICRC certified team at (562) 431-9400. We are standing by 365 days a year, 24/7 to take your call. 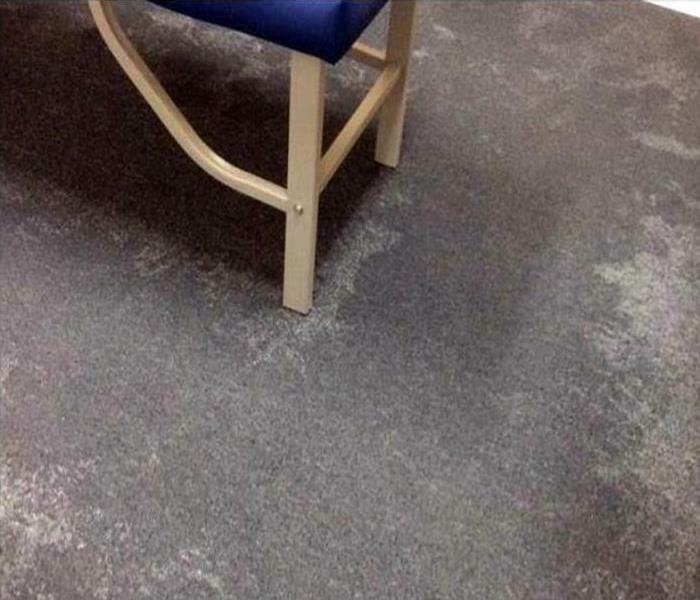 SERVPRO Franchise professionals were able to restore this room after a plumbing failure. We did a flood cut to remove the damaged drywall and insulation and expose the structure to dry. We also applied an anti-microbial to inhibit future mold growth. The owner was pleased with the results, and the room is ready to be finished. SERVPRO of Seal Beach / Los Alamitos / Cypress is available 24/7 to make it "Like it never even happened." After discovering a small leak under a kitchen base cabinet, our Seal Beach customers called us, SERVPRO to dry out the area. We uncovered a significant mold infestation that required the removal of the cabinets and sheetrock in a neatly controlled demolition. The Photo illustrates our work; an antimicrobial product sprayed and now ready for the installation of new cabinets. Count on us to do it right, from water damage to mold remediation; we are trusted leaders in the restoration industry. Mold can spread in any area of your home if the conditions are right. 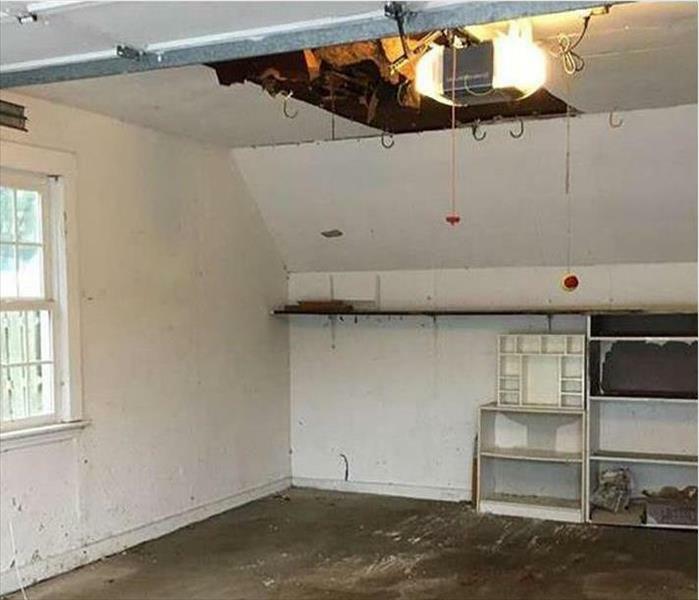 This can often include a garage. One recent satisfied client called us with just such a complaint. Contact our SERVPRO team if your home is facing a similar problem or mold in any part of your home. Our IICRC certified technicians will quickly respond to your situation and arrive on the scene with advanced tools to investigate the extent of the infestation and remediate the damage. 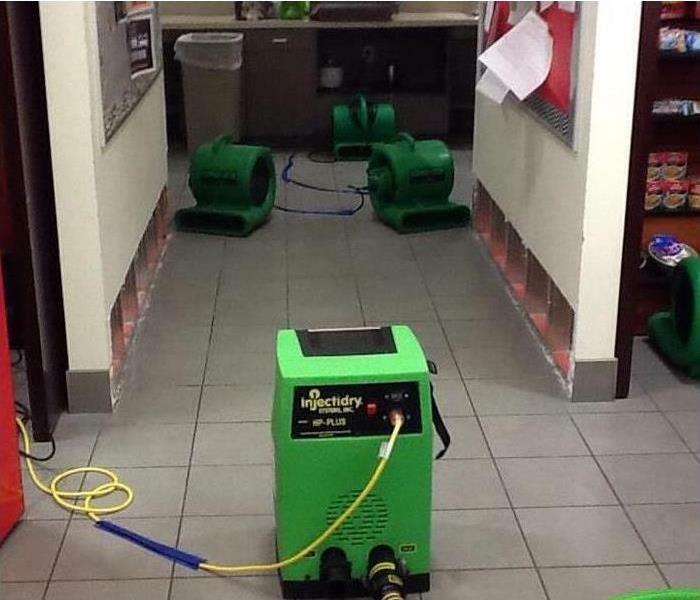 When your commercial property experiences a water damage emergency you need to call the team at SERVPRO. Our technicians are ready 24/7 and will arrive quickly. SERVPRO of Seal Beach / Los Alamitos / Cypress has the experience, training, and equipment to restore your property to pre-damage condition. 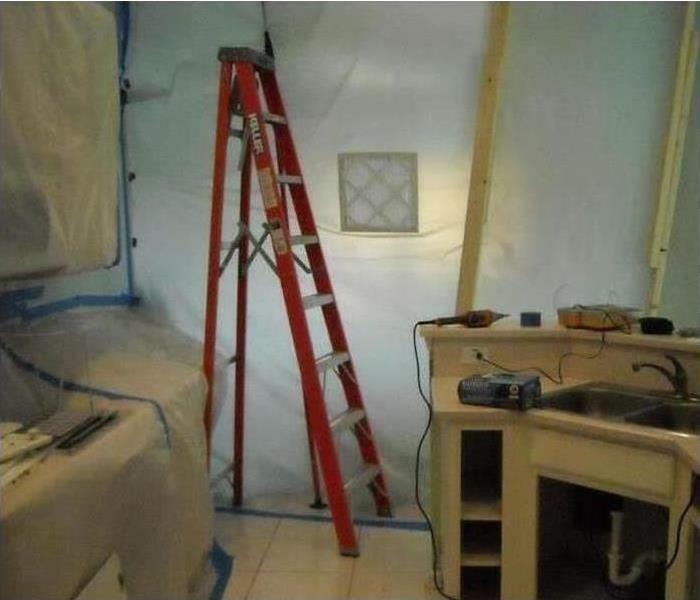 Mold damage was discovered in the bathroom of this Seal Beach house. 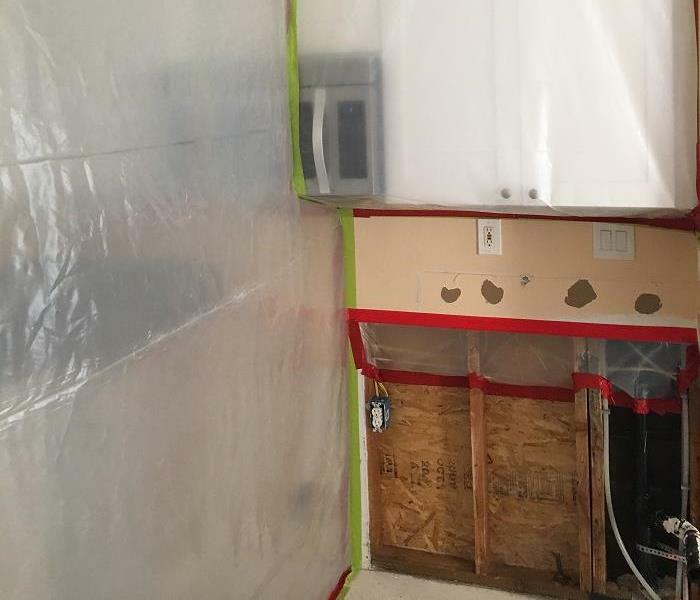 When SERVPRO of Seal Beach / Los Alamitos / Cypress is contracted to clean up mold in commercial or residential property, it is routine for us to construct a containment area like the one pictured. The containment area prevents mold spores from traveling throughout the structure while the mold damage is being cleaned up. A strong storm disturbance resulted in a tree crushing a portion of a roof in Seal Beach. The damaged area can be covered with a tarp by a SERVPRO crew, and the timber cut away from the damaged area. Protecting the interior from secondary damage is of paramount concern. 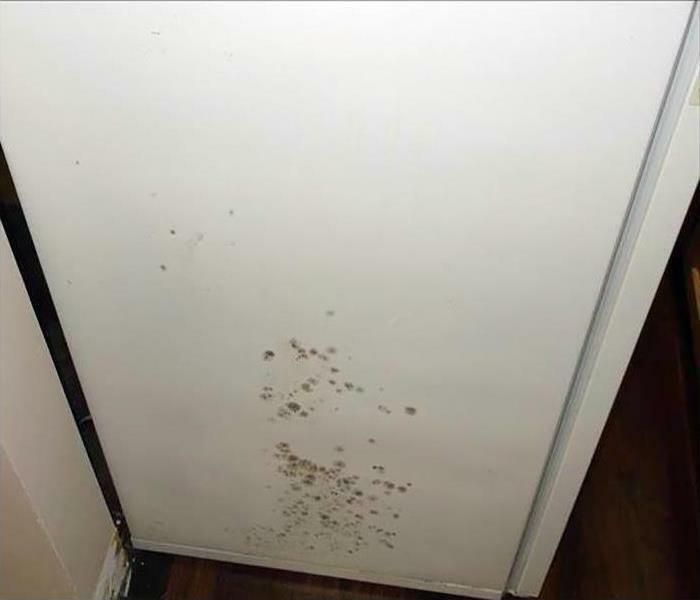 Mold damage does not stand a chance against our technicians! Our crew at SERVPRO has the state-of-the-art equipment, mold damage experience, and advanced training to restore your home to pre-damage condition. Our mold damage experts are ready 24/7 and Faster to Any Size Disaster. 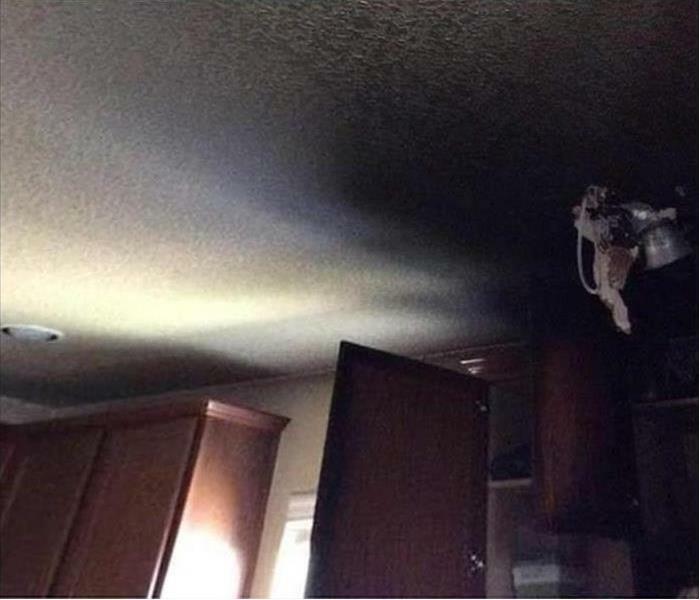 The smoke residue from the kitchen fire in this Los Alamitos home can be cleaned up by SERVPRO's talented and skilled technicians. We clean up and restore, no need to replace the cabinets and ceiling panels. Just call us for help. SERVPRO is prepared 24/7, locally owned and operated, and Faster to Any Size Disaster. 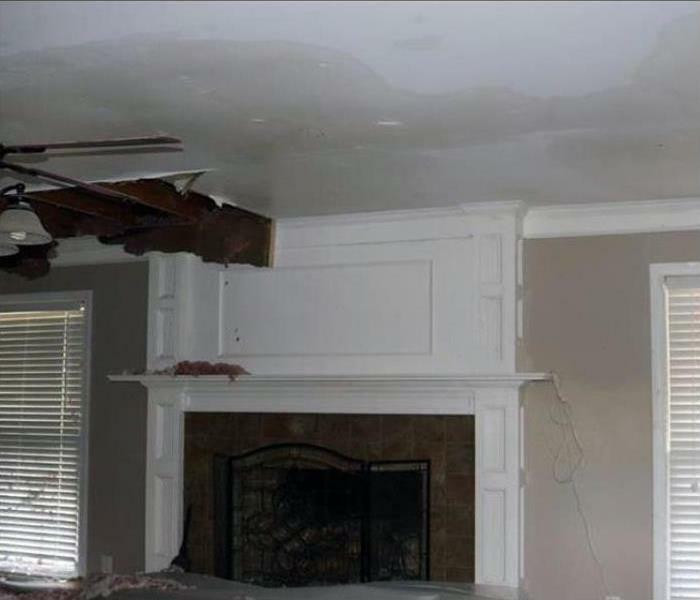 Our team will arrive at your home quickly and begin our restoration process immediately. We have the equipment, training, and water damage experience to restore your home to pre-damage condition. 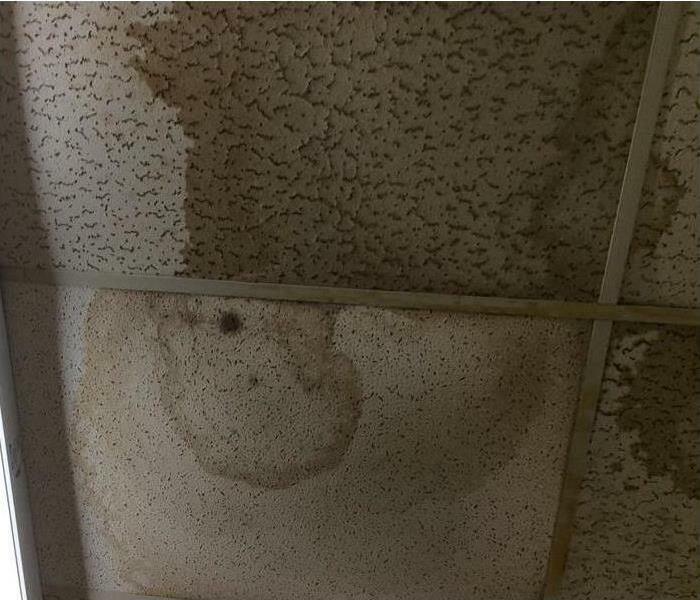 The broken water line in the mezzanine of this commercial building in Los Alamitos soaked the ceiling tiles. The visible water stains can pose a hazard to the employees working below. SERVPRO can first remove the wet material and then begin the drying process. If your property experiences a storm damage emergency, you need to contact the experts at SERVPRO. Our 24-hour emergency service allows our experts to be ready to respond quickly to your call. SERVPRO of Seal Beach / Los Alamitos / Cypress has the equipment, training, and experience to restore your home to pre-damage condition. We’re Faster to Any Size Disaster! During construction of a home offers opportunities for flash fires that can char the raw lumber in a Cypress attic. 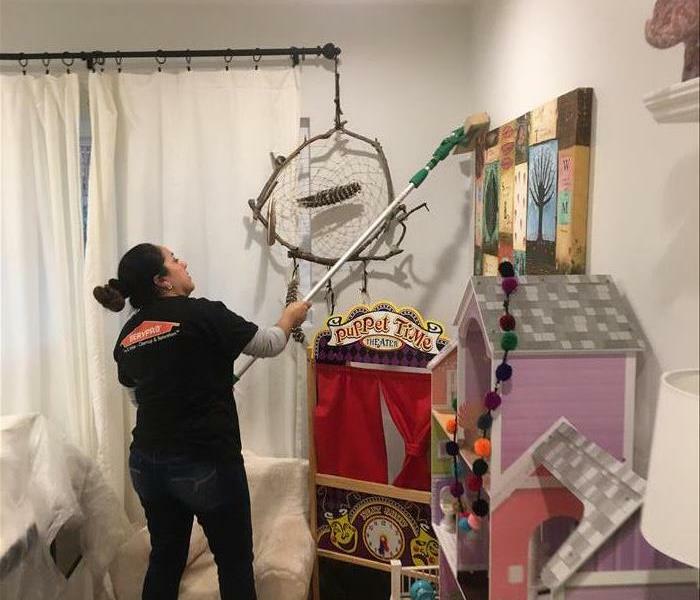 When there is not structural damage, SERVPRO technicians can remove the burnt residues, prime the damaged wood and eliminate the odors with an ozone machine. 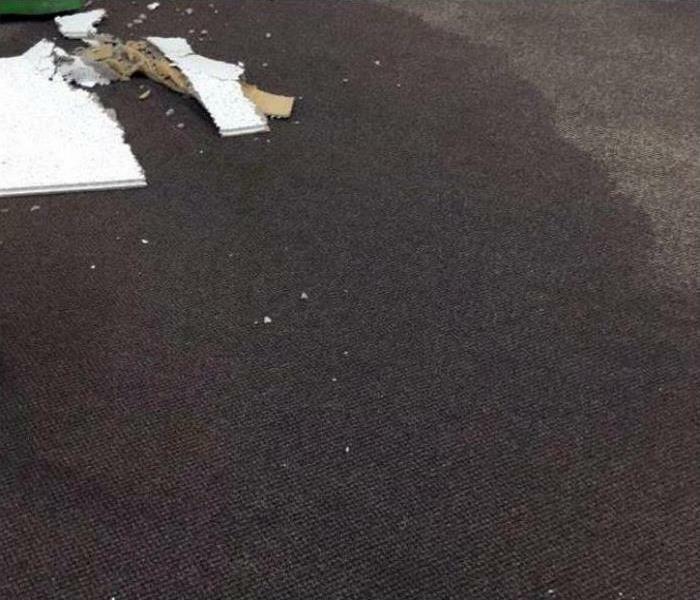 Commercial water damage was suffered at this Seal Beach business when a water pipe in the restroom broke. 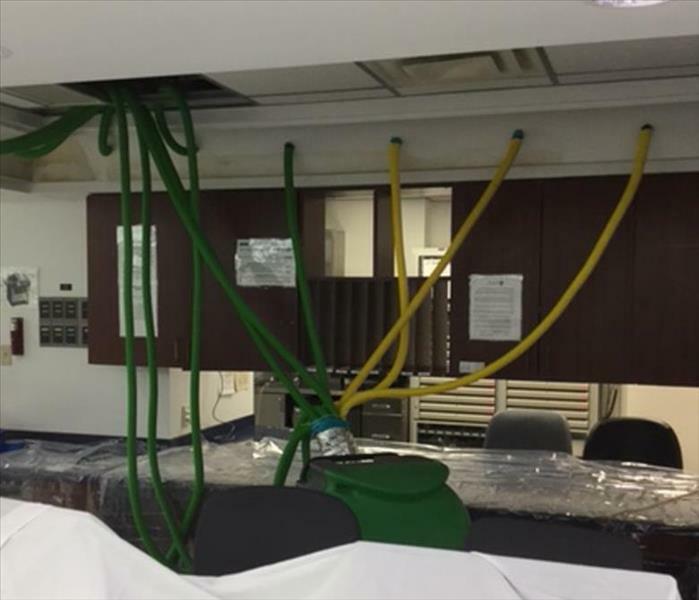 The problem led to water flowing in the hallways of the facility. All of the affected materials needed to be removed. 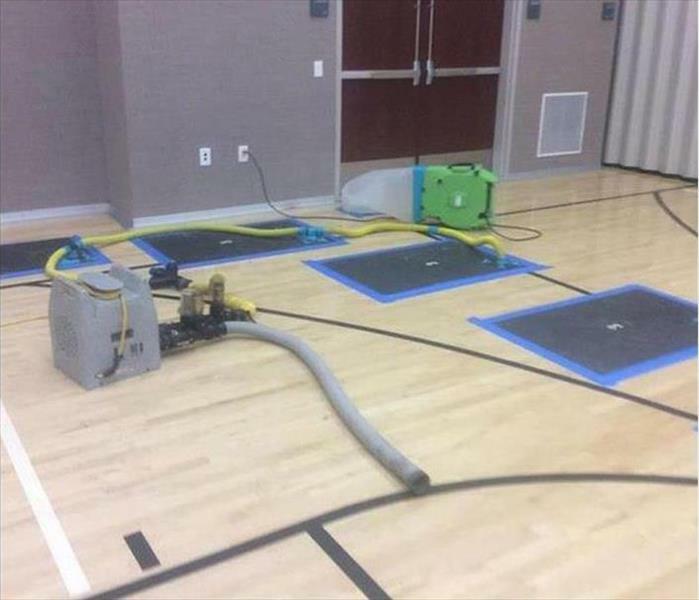 SERVPRO of Seal Beach / Los Alamitos / Cypress would handle this water damage restoration from start to finish. When dirty, stormwater covers a basement floor area, the water wicks into the drywall and ruins it. 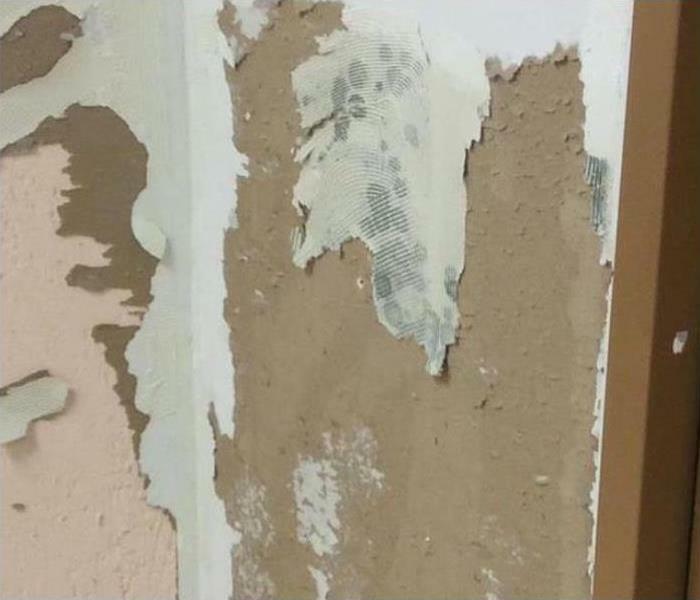 A flood cut by SERVPRO technicians can remove the damaged material from this Cypress home, dry out the wall cavity and the studs, and spray an antifungal agent in the preparation of new drywall installation. The crew at SERVPRO of Seal Beach / Los Alamitos / Cypress is the best when it comes mold damage remediation and restoration. Our mold damage experts have the experience, training, and equipment to restore your home to pre-damage condition. We are locally owned and operated, available 24/7, and Faster to Any Size Disaster. The hood in this Cypress kitchen caused a fire from the buildup of grease in the filter. 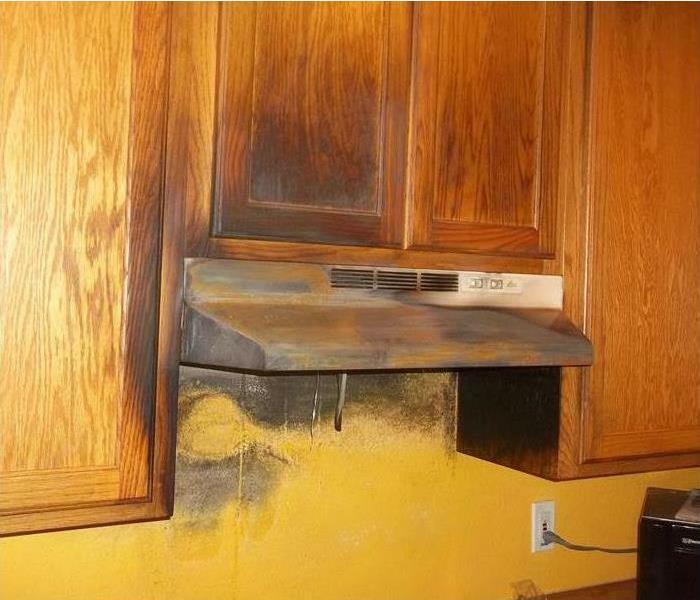 The charred cabinets and wall can be wiped and restored by SERVPRO skilled technicians. We strive to restore and not replace burnt materials whenever possible. 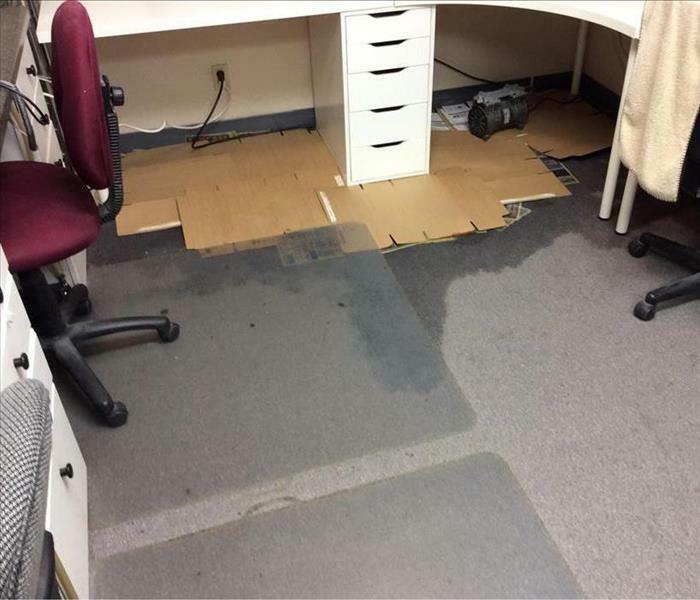 Water damage at a Cypress residential or commercial location cannot always be seen or even felt. 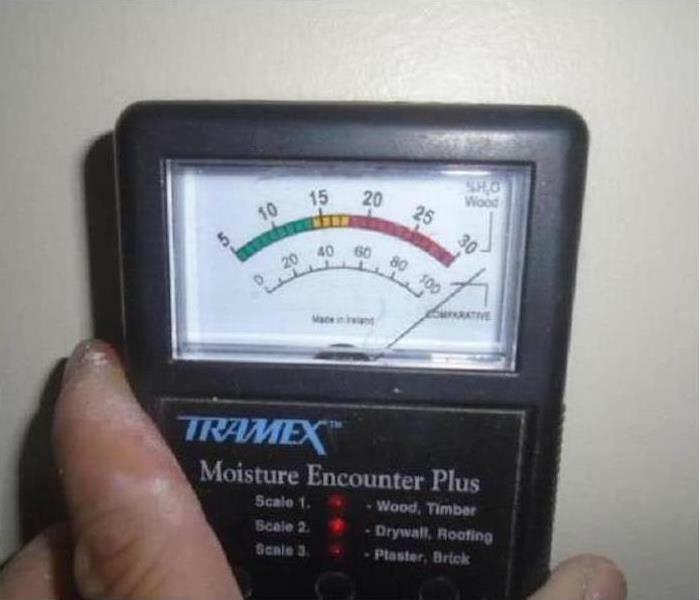 SERVPRO of Seal Beach / Los Alamitos / Cypress uses hi-tech moisture detection meters like the one shown to find hidden pockets of moisture that need attention. 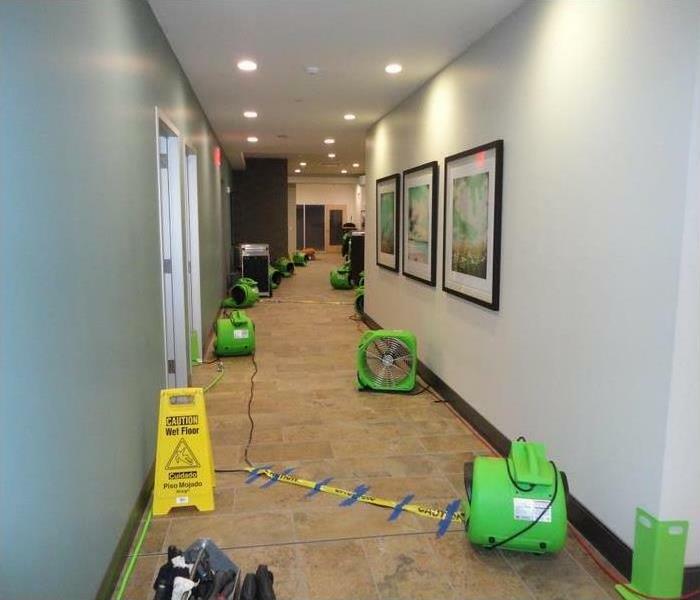 Contact our team right away if your commercial property experiences a water damage emergency. Our specialists are ready 24/7 and Faster to Any Size Disaster! SERVPRO of Seal Beach / Los Alamitos / Cypress has the equipment and experience to restore your property to pre-damage condition. The storm dumped rainwater through a damaged roof creating a large amount of unwanted wetness in this Seal Beach commercial building. The SERVPRO technicians opened up the attic crawl and set up a large number of injectidry hoses to force in the air to increase the rate of circulation and then evaporation. The furnishings were covered wherever necessary for protection from the moisture. 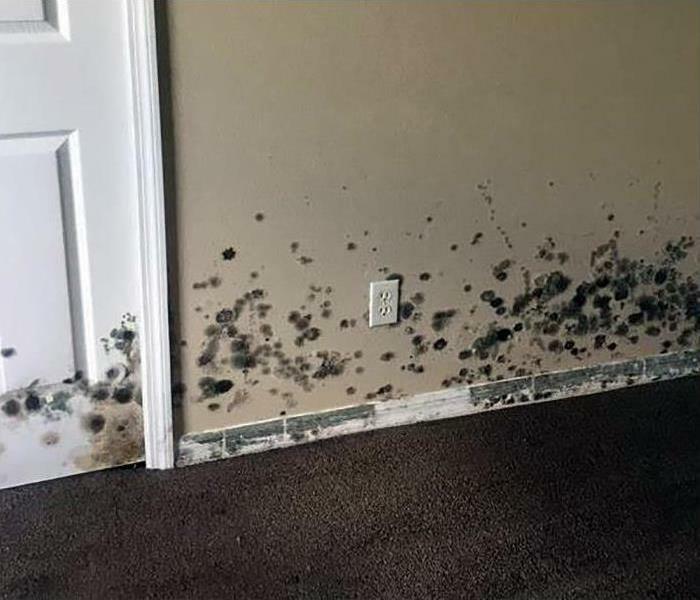 When your home has a mold infestation, you need the experts at SERVPRO to assist you. 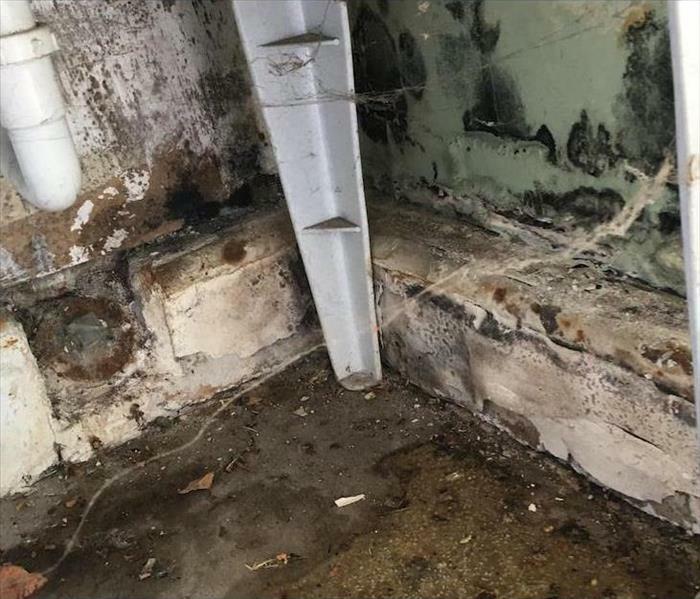 Our team will arrive quickly and start the mold remediation process immediately. SERVPRO of Seal Beach / Los Alamitos / Cypress has the state-of-the-art equipment, specialized training, and experience to restore your home to pre-damage condition. The smoke residue on this wall of a Los Alamitos home illustrates how water from the firefighting efforts can exacerbate the damage. SERVPRO advises homeowners to call us to cautiously remove these smoke and soot stains with our equipment and detergent successfully. Smearing only adds to the mess and the costs. Get it done right. 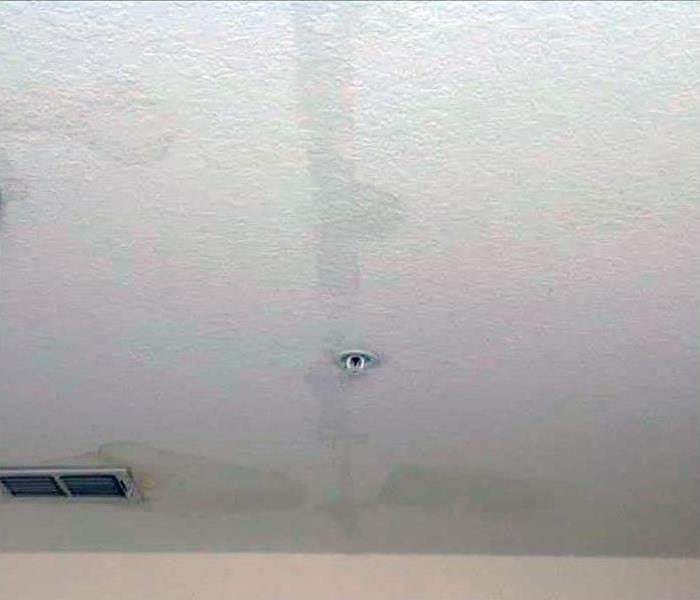 Water damage at this Cypress home was the result of a leaky water line running above the ceiling. 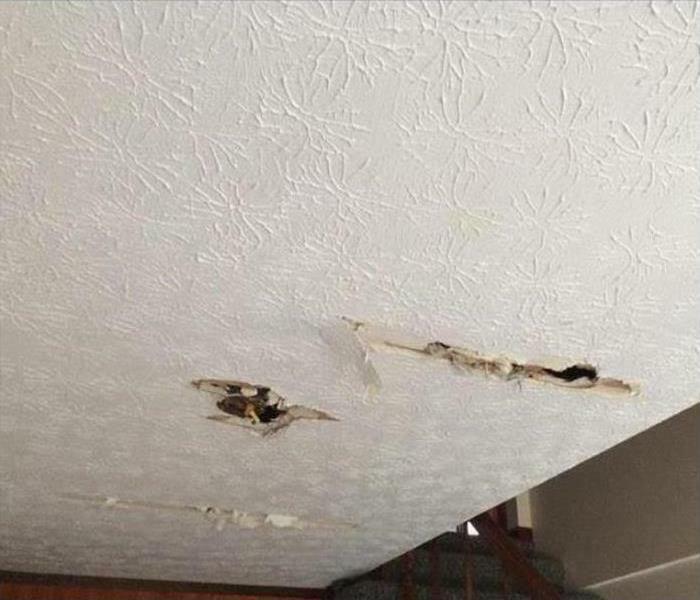 The photo shows the wetted drywall ceiling. This is a hazardous condition as the ceiling could collapse at any time. 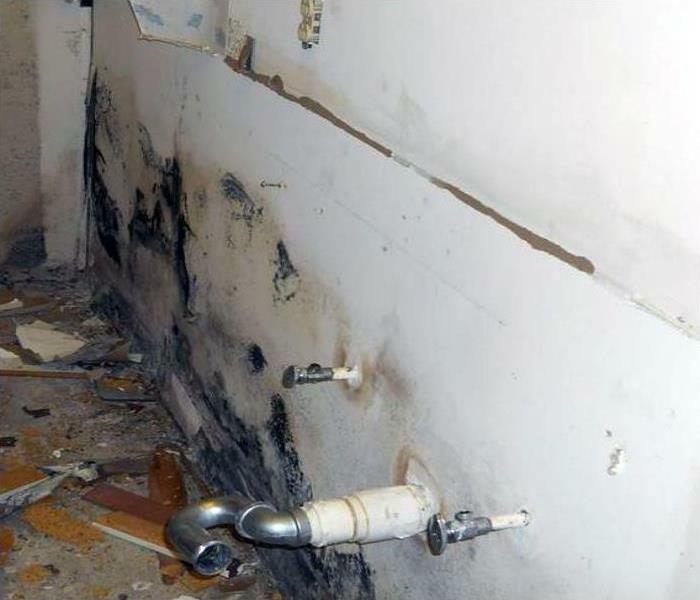 The homeowners chose to seek out professional help for their water damage problem. SERVPRO of Seal Beach / Los Alamitos / Cypress provides 24/7 emergency service for your disasters. 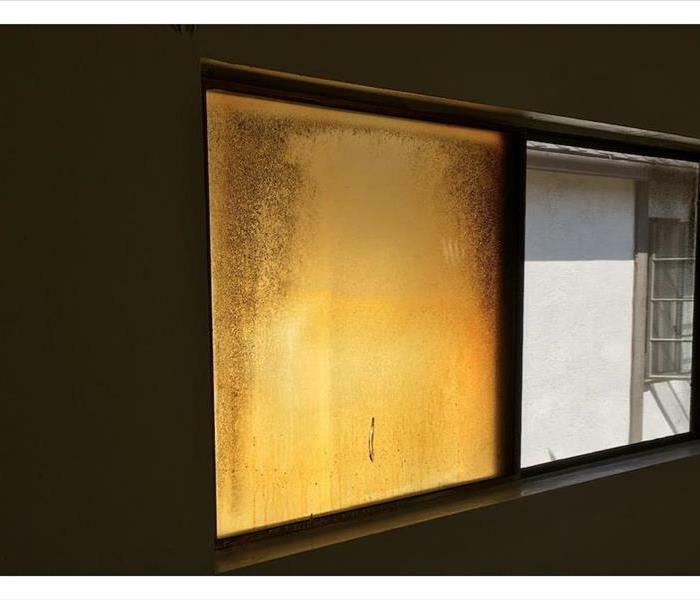 The water from the leak once removed from a Seal Beach office suite needs moisture removal and restoration of an operational RH relative humidity to protect the staff and equipment. SERVPRO can provide the proper industry-leading tools and devices plus monitoring of the ambient air to achieve good indoor air quality. Storm Damage in Cypress can sometimes take on gigantic proportions requiring oversized commercial equipment for water restoration projects. SERVPRO of Seal Beach / Los Alamitos / Cypress is a locally owned company and part of a nationwide network of franchises giving them access to any equipment needed. 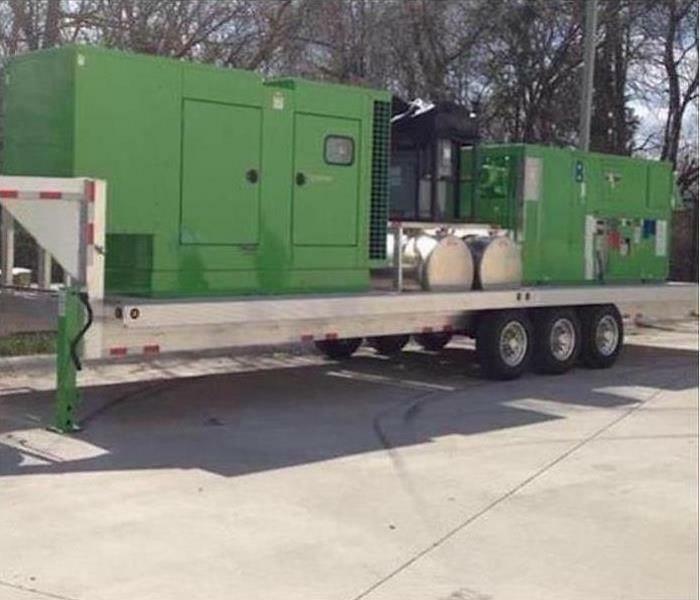 Pictured is a large trailer mounted desiccant dehumidifier. A minor mold infestation can still cause significant problems for you and your home. 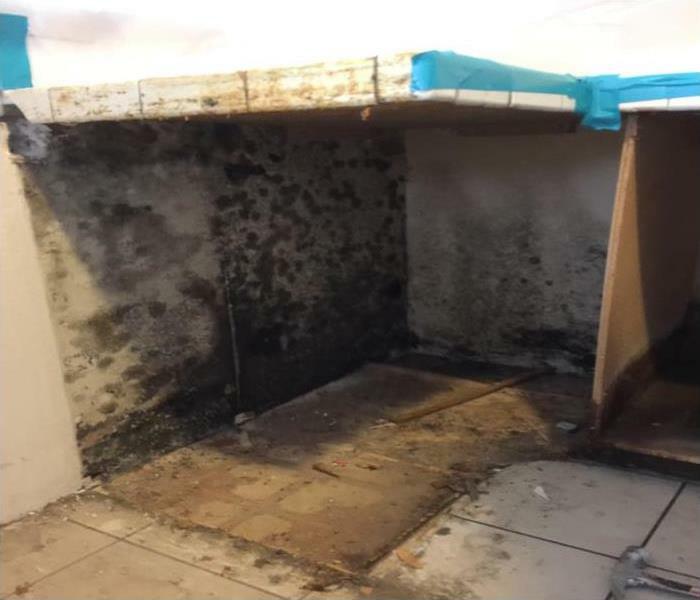 Mold doesn't stand a chance against our trained and certified team of mold remediation technicians. We have the state-of-the-art equipment needed to restore your home to pre-damage condition. 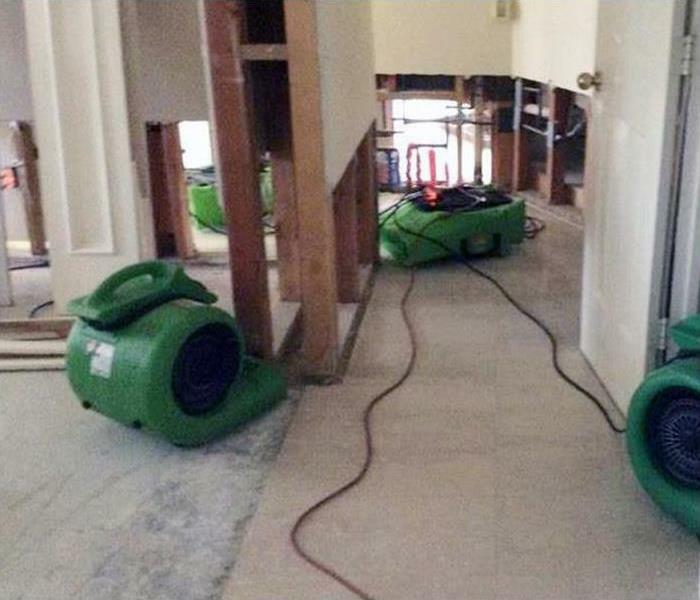 SERVPRO of Seal Beach / Los Alamitos / Cypress is Faster to Any Size Disaster! Fire damage at this Seal Beach home left this piece of bedroom furniture charred from the heat of the fire. 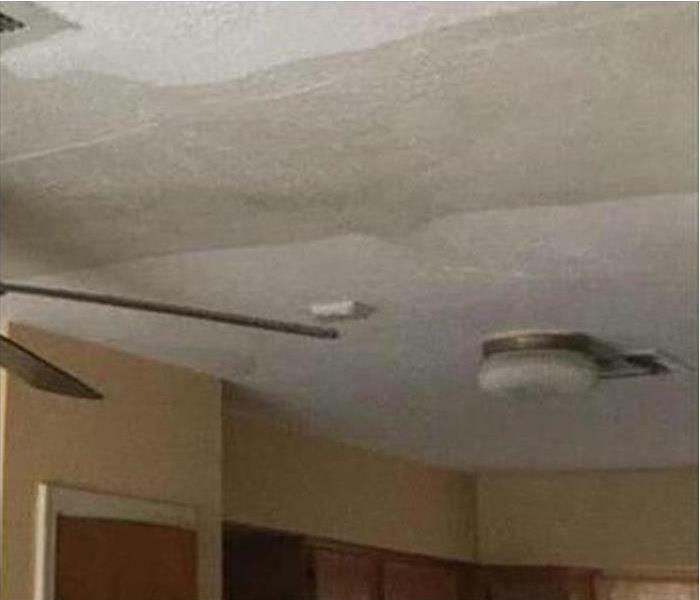 The homeowners and their insurance adjuster thought it would need to be replaced. 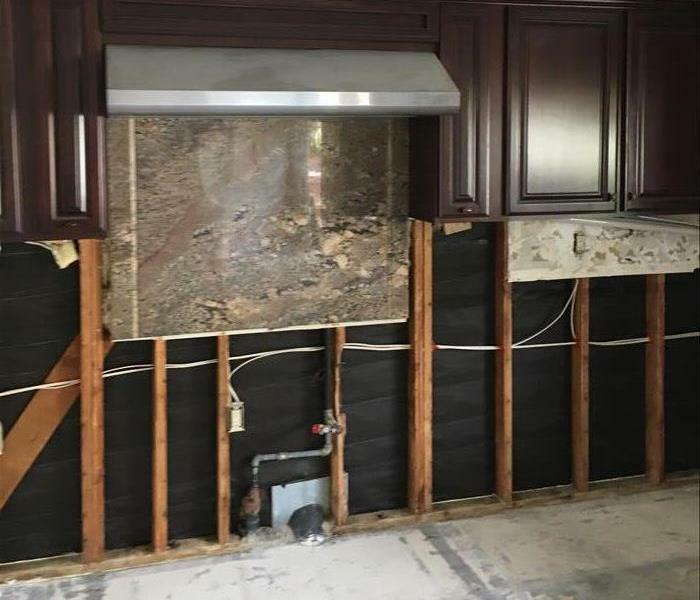 However, SERVPRO of Seal Beach / Los Alamitos / Cypress technicians are specifically trained and certified in methods to restore damage of this nature. Our goal is always to restore when possible saving our clients time and money. Drying mats and dehumidifiers can efficiently extract lingering moisture in the joints and recesses of hardwood planks. Los Alamitos schools and other areas can always benefit from the prompt and technical services provided by SERVPRO to salvage expensive building elements. A straight line wind ripped a hole in the attic of this Seal Beach home over the garage. 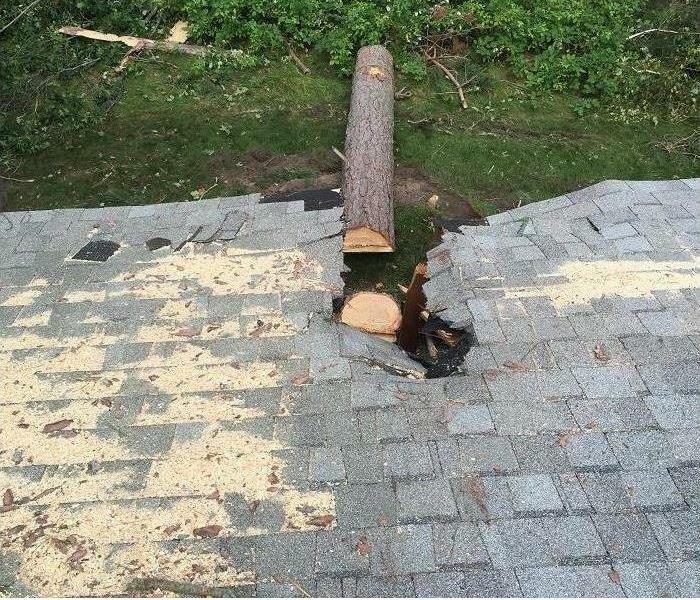 In storm cases like this, the wise call is to SERVPRO because We're Faster To Any Size Disaster and we can quickly tarp the damaged roof to prevent secondary damages from occurring. When water is allowed to pool on a hardwood flooring for several days, the result is often the buckling shown in this photo. 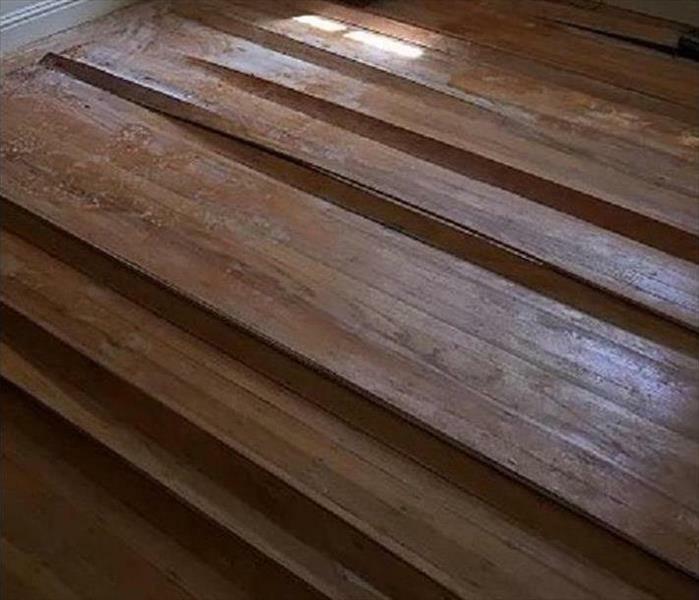 SERVPRO has the skilled technicians to lift and remove some of these planks to dry out the floor joists by enhancing the circulation of air. 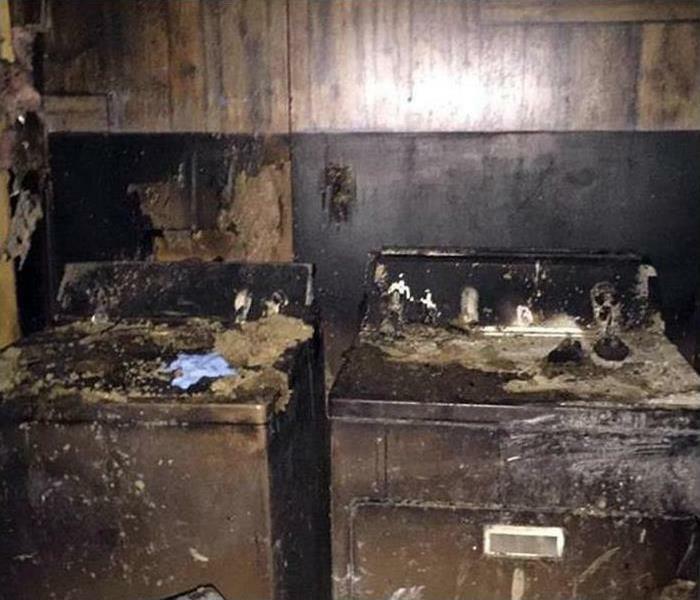 The exhaust hood was clogged with grease, heated up and ignited in this Los Alamitos kitchen. The damage was limited to the hood, walls, and the burnt wall cabinets. SERVPRO technicians can restore this charred elements to preloss condition. 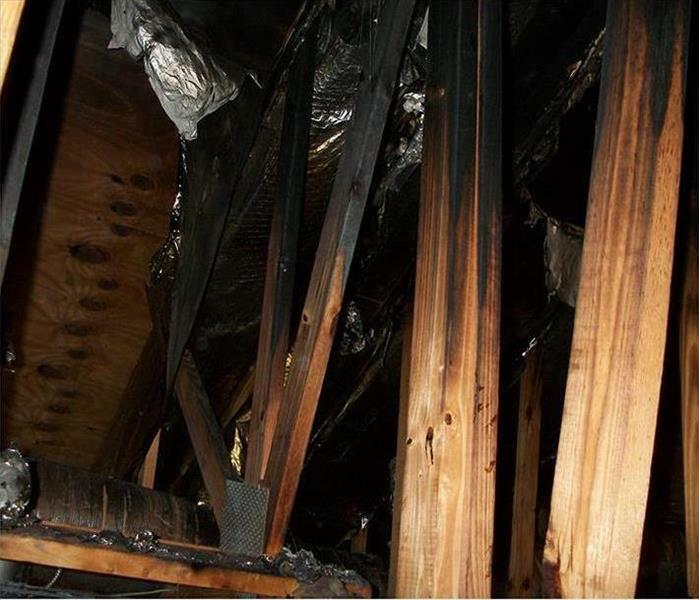 Odor mitigation and elimination are also crucial aspects of this fire damage clean up. 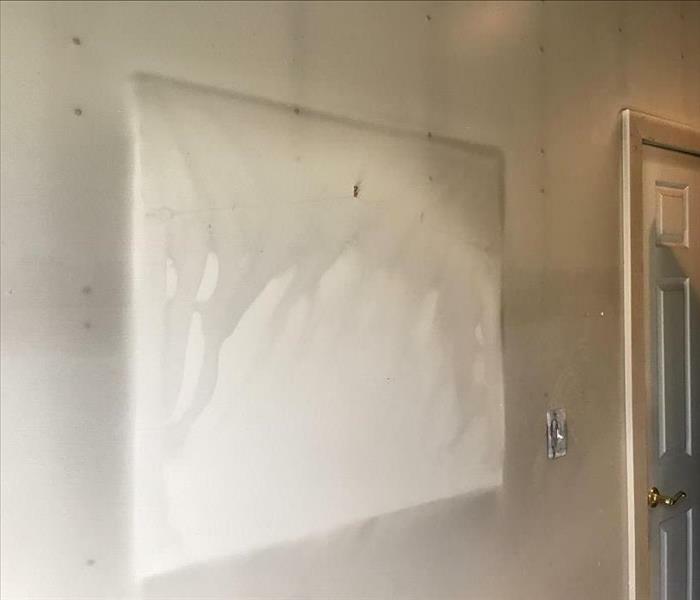 The moisture from the roof leak accumulated on the drywall backing of the sheetrock panels in this Los Alamitos house. 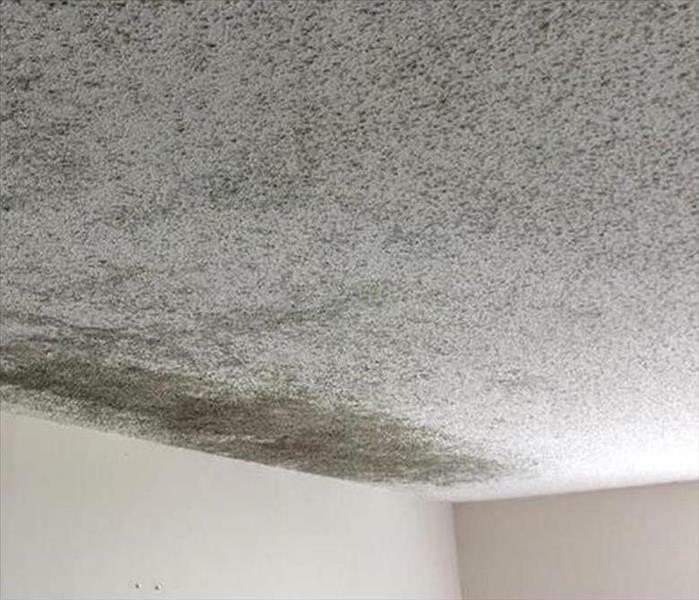 SERVPRO technicians can scrape off the popcorn ceiling surface and try to salvage the material. Sealing off this room helps to prevent mold spores from circulating to other areas of the home. We do it right the first time.